In the early hours of 19 February 1980, Bon Scott, lead singer of the rock band AC/DC, left The Music Machine in Camden, London, with a man called Alistair Kinnear, whereupon he lost consciousness and was left to sleep in Alistair?s Renault 5, parked outside Alistair?s East Dulwich apartment.That evening, Bon?s lifeless body was found, still in the car. He was pronounced dead on arrival at King?s College Hospital.Less than two months later, far away in the Caribbean, recording began on Back In Black, AC/DC?s tribute to their fallen bandmate. Worldwide, it would go on to become the biggest selling rock album of all time.The legend of the man known around the world simply as ‘Bon? only grows with each passing year - in death the AC/DC icon has become a god to millions of people - but how much of his story is myth or pure fabrication and how much of the real man do we know?There have been books that claim to tell his story. They haven?t even come close.Jesse Fink, author of the critically acclaimed international bestseller The Youngs- The Brothers Who Built AC/DC, leaves no stone unturned for Bon- The Last Highway, a book years in the making that finally solves the riddle of the death of Bon Scott.The 1977-80 period forged the legend of AC/DC. There wasn?t a harder working band in the music business. But, as Fink startlingly reveals, the relentless AC/DC machine was also threatening to come apart. Fink has answers to the nagging questions rock ?n? 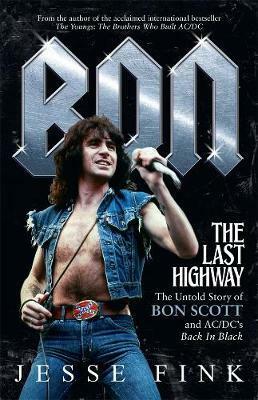 roll fans have been asking since 1980 and reveals secrets that will change music history.Bon- The Last Highway is the original, forensic, unflinching and masterful biography Bon Scott has so richly deserved and music fans around the world have been waiting for.